Providing the Best of Seattle Fishing! 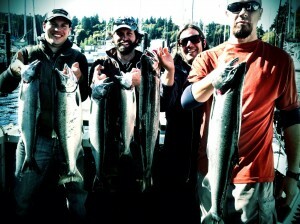 Tyee Charters offers daily Salmon fishing trips departing from Seattle or Bainbridge Island. We offer 6hr morning trips and 4hr afternoon trips to suit your trip needs. Puget Sound is a unique area to fish for Salmon, LingCod, and Halibut. With sweeping views of the Cascade and Olympic mountains, Seattle and Mt Rainier. Puget Sound is for the most part very calm water making for a great Seattle fishing charter experience. It is not uncommon to see Dall and Harbour Porpoise as well as Orca and Grey whales. We troll for the salmon with the best lite tackle available. Our goal is to provide you with the best Seattle fishing experience possible. Your Captains lifelong passion and pursuit of Salmon on Puget Sound will put you in the best areas to catch the big one! 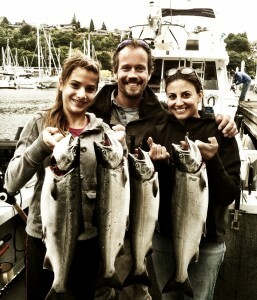 If we can’t get you out on a given day, we will recommend you to one of our associate Seattle fishing charters. We look forward to fishing with you on our boat! 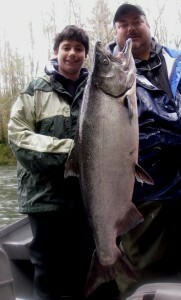 Salmon and Bottom fishing on Puget Sound & Steelhead and Salmon on the Olympic Peninsula. Call Us at 206.799.2530 or Email maligem@comcast.net. To view our blog, Click Here. To book morning or afternoon Seattle Fishing Trips, or Olympic Peninsula Steelhead Fishing Guides, Click Here for rates. Tyee Charters of Seattle WA is a fishing boat charter that specializes in fishing on Puget Sound including Washington salmon and steelhead.